"One of the most enduring metaphors for the spiritual path is the transformation of the lowly catepillar into a butterfly. Out of its own substance, the ground-hugging grub weaves the medium for its metamorphosis—the chrysalis within which it evolves into a beautiful creature with wings. The human being undergoes an equally dramatic transformation, unfolding the path to liberation from within the depths of the soul and emerging, after great struggle, as an expression of divinity in the worlld." The word “transformation” first became popular during the 1960s and 70s, as the new wave of universal spirituality began to break. For "new-agers" it was a word associated with spiritual awakening, though its deeper meaning would await discovery through experience. By the 80s and 90s, the word had become a trendy synonym for change in the corporate world, and by the start of this millennium it had entered the lexicon of government agencies, most notably the Pentagon. For decades, the spiritual significance of transformation was all but dead and buried in the wider world, except for those who sought its hidden depths from within. In the ageless wisdom teachings, transformation is the process by which a human being becomes a spiritual being—an individual who comes to embody the divinity of the human soul. 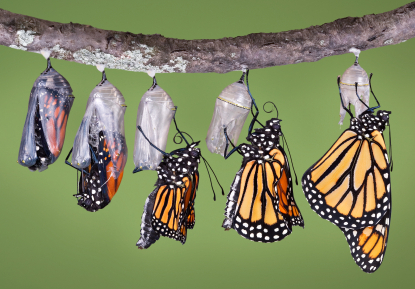 It is a process of metamorphosis that begins when the soul in incarnation awakens to its spiritual essence and discovers the path of return to its Source. Along the way, the individual who was identified with the outer persona—body, emotions, and mind—becomes identified with the Soul, the true or higher Self. Ultimately that outer persona, which was once the mask of the soul, will become the vehicle for the soul's expression in the world. Now, at this crucial turning-point in evolution, humanity is awakening to its higher nature—the spark of the Godhead implanted in animal-man that gave birth to the fourth kingdom in nature, the human, millions of years ago. It is this divine spark, destined ultimately to serve in the redemption of the planet, which gave rise to the condition of duality—the clash between spirit and matter that has characterized human evolution up to this point. Friction between these polar opposites has resulted in endless cycles of conflict that have defined what we identify as 'human nature'—a flawed, conflicted and seemingly unalterable state of being. We're learning, however, as evolution proceeds, that friction eventually produces light: lifetimes of suffering ultimately give rise to the light of the Soul. With the awakening of countless thousands of souls to the inner spark of divinity, the seeds of a new era in consciousness are being sown. The path of material living, of identification wtih matter and material assets, is drawing to a close for many people around the globe. The realization is growing that we are more than physical beings with emotions and minds; that there is a spiritual dimension of the human being that ennobles, elevates and expands the experience of living. It is becoming known that there is a path of transformation by which the love, light, power and beauty inherent in the Soul is gradually revealed. Technically speaking, the process of transformation occurs in three stages of progressive unfoldment, according to the ageless wisdom. The terms used to describe these stages are: transmutation, transformation, and transfiguration. Lifetimes are required to complete the metamorphosis that culminates at the stage of transfiguration, when the light of the Soul floods the outer persona and changes it—permanently. What makes the process painful is the “task” at its core: blending spirit and matter. To forge unity out of this exteme polarity, the part of us that is of a material nature must be purified and refined so that it may blend and fuse with that which is spiritual. The soul, the divine spark that is our true nature, is a 'unit of consciousness' that incarnates on the physical plane in a threefold form (body, emotions and mind) or personality in order to learn through experience on the material plane. During prolonged cycles of living, this germ of spirit is buried in the depths of matter. The personality is thoroughly identified with material living and governed by instincts, passions, and selfish desires fueled by ambition and greed—the qualities of the individual unaware of his or her spiritual nature. The human soul is imprisoned by the matrix of material forces in which it dwells until the moment of awakening, when the heart opens and one begins to sense the subtler dimensions of life. A mysterious alchemical process is set in motion by which the lower self or unredeemed persona (also called the human soul) gradually becomes aware of its higher counterpart—the divine Self (also called the spiritual soul)—existing on a subtler plane. When this awareness reaches a kindling point, a seeker of light is born and the way opens to the Path of Transformation. On this path, material forces such as aggression, greed and selfish pursuit are transmuted into spiritual energies such as wisdom, love, and the desire to serve others. What unfolds are subtle processes that are reflected in the subtleties of language conveyed in the wisdom teachings, where a distinction is made between energies and forces. The word energy generally refers to that which is formless—spiritual substance that flows freely. The word force refers to energy encased in matter and limited by form. The human being is transformed through the interplay of the two. Transmutation is the first phase of the transformative journey. It marks the start of a process by which material forces are elevated—in the goal of transmuting them into spiritual energies—through the power of the mind. At this initial stage in the life of the spiritual aspirant, the soul is not yet fully conscious of itself on its own plane but has become sensitive to subtler realities. The personality is still largely identified with its physical body, emotions and mind, but becomes sufficiently coordinated and integrated to begin the work of transmuting force into energy through the mind and will. The aspirant learns to charge or 'step up' material force into soul energy by concentrating the mind to the degree that it can effect the subtle forces of the threefold personality: the mind itself, the astral or emotional body, and the vital energy body that underlies the physical form. Throught the power of focused thought, one learns to raise the emotional forces of the desire nature (anchored in the solar plexus center or chakra) to the heart center. In the heart center, the separative force of personal desire is transmuted into the magnetic energy of spiritual love. Altruists, idealists, and all people who work for the greater good of humanity exemplify the transmutation of the force of the desire nature into the energy of love. Creative people embody another facet of transmutation: the lifting up of procreative forces (located in the sacral or sexual chakra) into the creative energies associated with the throat chakra. Individuals working in this way are often engaged in some form of communication, broadly defined. They may be artists, musicians, writers, philosophers, or scientists making new discoveries. Through their chosen vocation or avocation, they actively transmute the “raw material force” of sexuality into its higher octave of creative expression—often in the goal of enhancing the lives of others. There are countless examples of creative genuises throughout the ages who have wrestled with their lower natures, struggling to transmute the vital forces of their personalities into service to the world. Once the mind can successfully direct the forces of the persona, and the lower forces have been sufficiently converted into higher energies, the stage of transmutation gives way to transformation. The goal of this second phase of the journey is the integration of material force and spiritual energy into a smoothly functioning unit. By the time of its completion, the light of the soul imbues the outer persona, transforming it into a vehicle dedicated to fulfilling the soul's purpose. This phase is sparked by a growing awareness of the reality of the soul. The individual increasingly recognizes the inner self as a unique “entity”—distinct from the personality that is identified with the life of the material world. It is here that one most acutely encounters the sense of duality between the two aspects of the human being: spirit and matter. We continue to experience life as a personality with various identities: teacher or lawyer, artist or activist, mother or father, husband or wife. At the same time, the boundless, timeless, liberated dimension of the spiritual Self breaks through to conscious awareness. The challenge of this stage on the path is finding the way to overcome the increasing dissatisfaction that arises from the awareness of living in two worlds or having two conflicting aspects of self. For many reasons, among them highly practical ones, the worldly persona continues to play its roles while the higher Self slowly learns to attune to a subtler plane of reality. As the journey unfolds and the focus of consciousness shifts from the outer world of form to the inner world of meaning, a struggle for control takes place between the two aspects of self. This struglgle continues until, in the end, the personality surrenders to the soul. The price of spiritual transformation is high. It involves a prolonged inner battle as the soul, emerging further into conscious awareness, seeks to control the lesser self, the persona, which fights hard to maintain its habitual ways of living. Deep-rooted attachments to the material world where selfish motives and drives predominate, are not easily yielded to the higher Self. Thus the seeker is pulled in two directions—towards the unfamiliar realm of spirit and towards the still attractive realm of matter. The path forward is the Middle Way—“the narrow razor-edged path” that leads between “the two great lines of force.” While treading this path, the personality is increasingly exposed to the transforming light of the soul. Technically, the name of this stage of the journey is the path of discipleship. It follows the path of aspiration, during which the seeker aspires to live a spiritual life by transmuting lower forces into higher energies. What comes next is a conscious commitment to a life of self-discipline and active service in the world. Spiritual disciplines such as meditation, study and service become habits of daily living. Gradually, as the soul gains control of the outer form, the disciple's life is transformed from within. Under the soul's influence, the personality begins to display spiritual qualities such as compassion, wisdom, and inclusive love. The individual learns to stand in spiritual being, increasingly aligned with the higher Self, conscious of the Self's purpose for a given lifetime, and committed to fulfilling that purpose in service to the Good. It is said that this phase of the journey, the pursuit of self-perfection, takes lifetimes. The disciple passes through inner “battlefields” and “burning grounds” designed to eliminate the self-centered tendencies of the separative personality and reveal the soul's essential unity with all souls and all lives. Undergoing repeated tests and trials in the goal of self-purification, the soul ultimately emerges triumphant. The germ of divinity implanted in the human being at the start of the evolutionary journey begins to manifest as inner beauty, goodness and wisdom. During the first stage of the transformative journey—transmutation—it is the mind that plays a major role as the agent for lifting force into energy. In the second stage, transformation, the soul emerges into consciousness as an agent of purification, gradually taking control of the threefold outer form. In the third and final stage, transfiguration, the spirit completes the process that began with the soul’s awakening. At this point, the soul has unequivocally won the struggle to control the personality. Duality has been resolved into unity at a significantly higher turn of the spiral of consciousness. The light of the soul now floods the purified and unified vehicle, infusing the consecrated lesser self with spiritual energy, transforming it into an instrument of divine expression in the world. The soul-infused personality stands visibly transfigured before the world as a radiant Being of Light. The best-known exemplars of transfiguration have come to us through the teachings of world religions: the Buddha, emerging visibly illumined from his six-day meditation under the Boddhi Tree; Moses, surrounded by blazing light as he received the Ten Commandments on Mount Sinai; the master Jesus, appearing as a luminous being to his closest disciples on Mount Tabor, completely transfigured by spiritual light. If you have enjoyed this article, you may wish to read When the Soul Awakens. Nancy Seifer and Martin Vieweg. When the Soul Awakens. pp. 93-94. Alice A. Bailey. The Rays and the Initiations. Lucis Publishing Company, 1960, p. 278.